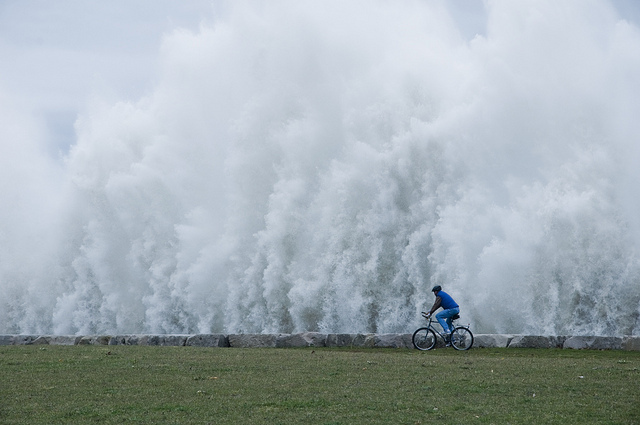 Superstorm Sandy caused near-record storm surges in Chicago's Diversey Harbor. 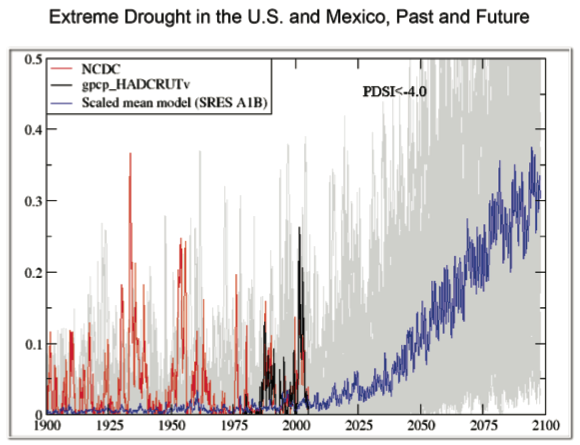 In addition to producing more extreme precipitation events, climate change is expected to prolong droughts in the Midwest. 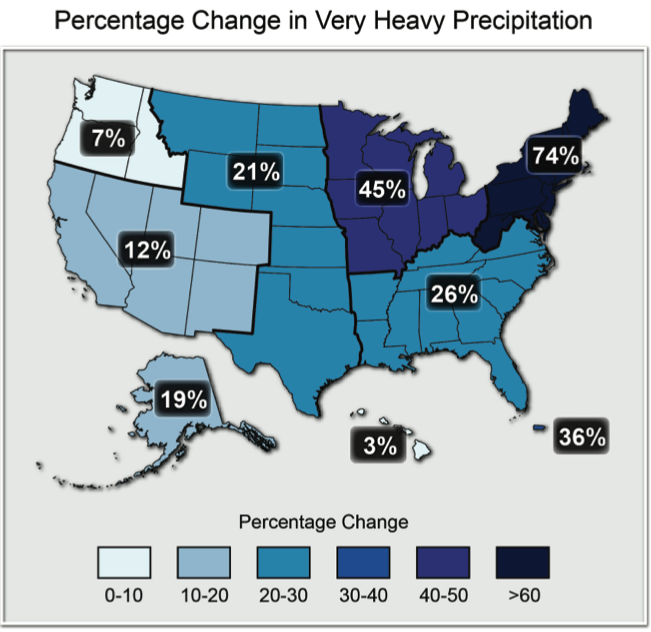 The draft report predicts more extreme precipitation events. The draft of a new report on climate change minces no words. Released Monday for public comment, the draft is the latest in a series of National Climate Assessments requested by Congress. Lower agricultural productivity. Longer growing seasons and higher concentrations of carbon dioxide will increase some crop yields. Those benefits, however, “will be increasingly offset by the occurrence of extreme events” like heat waves, droughts and floods. But, we don’t know the rate of grain yield improvements, or the degree to which future genetically modified organisms could cope with new conditions. Fleeing forests. Tree species that can will shift northward in pursuit of familiar climatic conditions. That could change local ecosystems and even compromise the Midwest’s role as a net carbon absorber. Public health risks. More heat waves, worse air quality and worse water quality (via combined sewer overflows) will result from higher temperatures and the increased occurrence of extreme weather events. But, there are steps we can take. Improving building stock and access to air-conditioning or cooling stations could reduce deaths during heat waves; reducing pollution could blunt the exacerbating effect that higher air temperatures will have on the chemical reactions reducing air quality; and building green infrastructure could reduce the occurrence of combined sewer overflows. Eyes on us. The Midwest relies heavily on coal for electricity generation and our economy is dominated by carbon-intensive agricultural and manufacturing industries, which means the region’s per capita emissions are 20 percent higher than the national average. But, those same industries have the most room for carbon emissions reductions. Great Lakes threatened. Less ice cover in winter and longer droughts in the summer could further lower average lake levels. Warming waters could change which fish species call the Great Lakes home. Extreme conditions could set the table for invasive species. All that extra rain is likely to diminish beach health and water quality by contributing to pollution from runoff, potentially increasing the frequency of waterborne illnesses and harmful algal blooms. Reduced ice cover could also lengthen the shipping season, but low lake levels might increase the cost of shipping freight nonetheless. On the heels of reports that 2012 was the world&apos;s 10th warmest on record, the draft report warns that severe heat waves like the one that claimed 800 lives in Chicago in 1995 could become a common occurrence by 2100. Extreme weather events were unusually common in 2012, leading to some hand-wringing in the media over whether or not climate change could be blamed for any particular storm. A helpful analogy is that of loaded dice. Most of the scientifically predicted effects of climate change are explained with varying factors of risk, not “if A then always B” causation. “The evidence for a changing climate has strengthened considerably since the last National Climate Assessment report, written in 2009,” reads a “Letter to the American People” that accompanies the report. The authors, led by Jerry Melillo of the Marine Biological Laboratory in Woods Hole, Mass., draw on the strongest evidence yet linking climate change to anthropogenic activities such as burning fossil fuels. Chicago’s Climate Action Plan and its Green Homes Program get shoutouts in the report’s section on climate adaptation. The authors count Chicago among the “vanguards in the creation of climate adaptation strategies.” Cities may be most at risk, the report suggests, but they may also be the most likely source of a solution. This report is only a draft, and the authors welcome public comment on the document until April 12. It is also subject to “extensive review” by the National Academy of Sciences. After it undergoes any subsequent revisions, the report will become an advisory document of the federal government.